As many of you will have seen, I was lucky enough to recently give an interview over at Blogger’s Bookshelf about The Book Habit. Without a doubt, one of the best things about starting a blog is becoming part of a community of people with similar interests, so chatting with Erin and the rest of the Blogger’s Bookshelf team was a massive pleasure. Engaged, as I usually am, in a battle of wills with my Twitter account (a few weeks in and I still do not understand the basics, meaning that I use hashtags with a worrying frequency), I happened to see a tweet from BB’s Erin about her jewellery business and literary-inspired pieces. Mentioning the words Snitch + necklace, I was obviously on this like a shot. Sawyer and Scout is Erin’s completely fantastic accessories business, stocking a variety of items that she makes herself. Her literary-based collections, including Harry Potter, The Hunger Games, and Divergent-inspired items, are completely unique and unbelievable value for money. Having seen an ‘official’ Snitch necklace for about four times the price, it took less than 30 seconds for me to place my order with Sawyer and Scout. Typically, physical demonstration of my bibliophile tendencies comes in the form of my enormous collection of literary-inspired tote bags. Now on my third The Great Gatsby reusable bag from Barnes and Noble, I really do have something of an addiction. 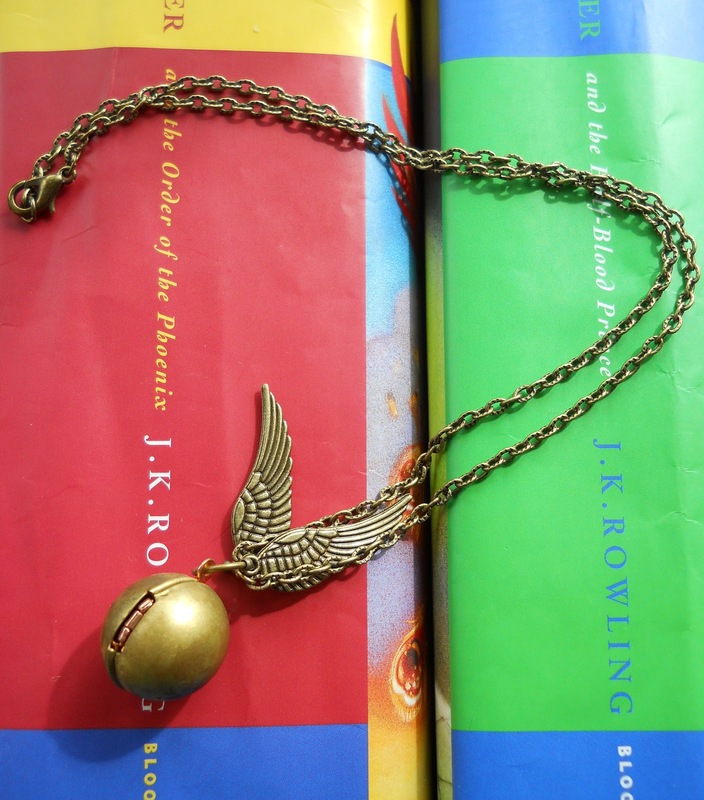 But I am beyond glad that I strayed outside of my usual stylistic zone to buy Sawyer and Scout’s Snitch necklace. It’s beautifully made, in locket form, and, as apparent from personal experience, will encourage children to engage in random Harry Potter spell battles with you. Needless to say, I won. 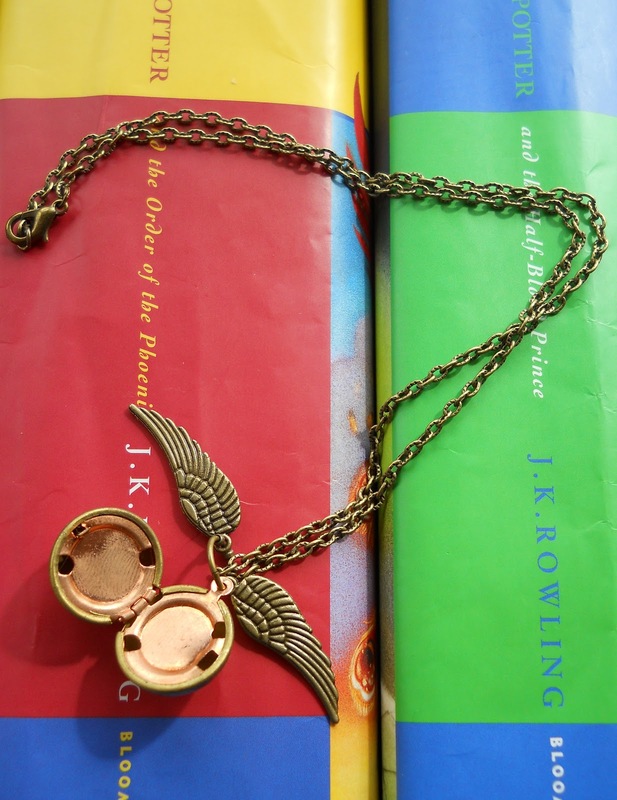 After emailing Erin with my necklace-related excitement, she very kindly offered to send me a further Snitch necklace to offer to my lovely readers in a Giveaway! The competition will run through to Friday 10th May. To enter, click below and answer the following question: What is your favourite childhood book and why? I’m opening the competition up to everyone, regardless of location, so all welcome! 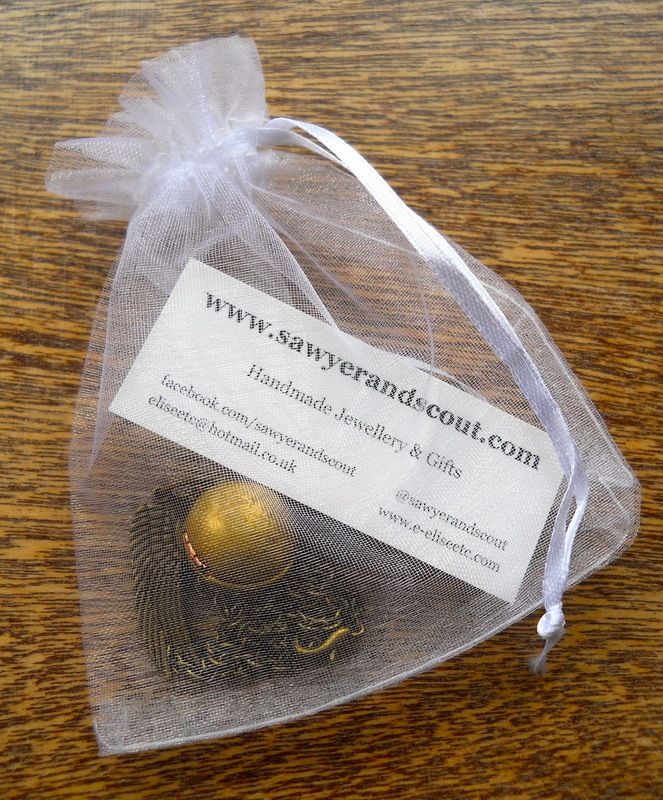 Please enter me in your giveaway.It would be great to winThe Harry Potter inspired Snitch necklace. In response to your question ofWhat is your favourite childhood book and why?My favorite childhood book isThe Cat in the Hat by Dr. Seussbecause it was the first book i owned and read.Thank you for having this giveaway!!!!!! Thanks for entering, Wayne. And good luck! There are two, the first was called Little Fingerling and it was a picture book about a japanese boy no bigger than a thumb. It is the book that made me love reading. The other book was called The Forgotten Beasts of Eld and that book was the book that made me love Fantasy, i havent looked back since.